Kula Bistro on Lower Kula Road, serves up delicious authentic homestyle cooking in Kula, at reasonable prices. Sandwiches and salads, pastas and pizzas, all done in a creative way with the oversight of head Chef Luciano Zanon. Come and enjoy breakfast, lunch and dinner in a lovely upcountry setting. This restaurant has changed hands a few times over the years, and this time it's a keeper. The location is really great for people who live in Kula since there's not many places to have a decent sit-down meal. You'll find them right across from Morihara Store, and there's plenty of off-street parking. There's lots of room for large groups here, and it's also comfortable for just a couple to dine together. Kids will enjoy their own menu. The waitresses are friendly and come around to check on you often enough. The menu features a lot of Italian inspired dishes, with fresh local ingredients. For example, the caprese salad is really good with juicy tomatoes and basil. The Kalua Pork eggrolls burst with unique flavors. The bakery case will make you think about eating dessert first! 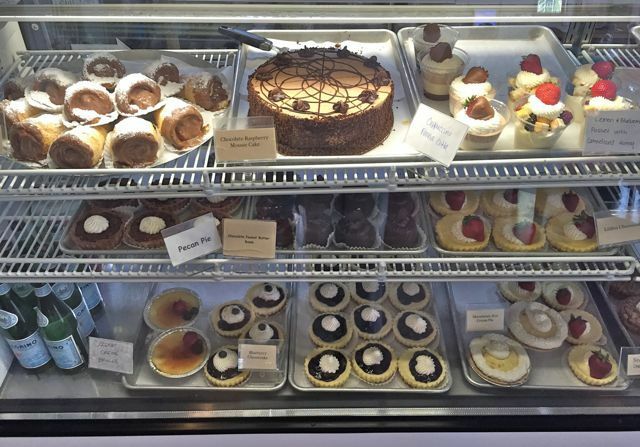 All pastries and desserts are made fresh daily, and what a selection. They say you can bring your own beer or wine to drink with your meal. That's a nice feature and easy to do with Morihara Store right across the street. Open daily from 7:30 am until 8:00 pm. but closed for breakfast on Mondays. Georgie Hunter R(S) I like to try the Kula Bistro delicious authentic homestyle cooking. Hi Georgie Hunter R(S) - next time I am on Maui, I will stop by. It looks delicious!